Challenging mainstream representations of Native Americans, Wendy Red Star photographs her Crow culture, on her own terms. An elderly Native American man wears a headdress,stoically looking at the camera. A lone boy, also in a headdress, sits atop a horse, gazing across the vast plains. These images, taken by Edward Curtis, can describe most representations of Native Americans. Silent. Historic. A “noble savage” long erased from American social thought. Even contemporary imagery renders Native Americans as historic caricatures: in mainstream culture, they appear most commonly in the form of mascots or sexualized costumes. But the subjects of these images are not silent. Native American activists and artists have always recognized this disconnect between reality and perception; they survived generations of federal policies meant to eradicate their populations and their culture. Yet whites were simultaneously interested in documenting Native cultures for their own entertainment. Edward Curtis, a photographer known for his prolific documentation of Native Americans, created over 40,000 images of Native American life. These images are thought of as a glimpse into the past; they did not necessarily represent Native Americans as they were, but how whites wanted them to be remembered. They craved the imagery and a romanticized American past, but not the Indian himself. In response to the widespread erasure of their subjectivity in popular images, an increasing number of indigenous artists are pushing back, and working to change the face of Native representation. They are portraying themselves and their communities, showing how they want to be seen and heard. Wendy Red Star, a Crow photographer based in Portland, Oregon, is one such artist. Red Star’s work is humorous, surreal, and often abrasive, yet deeply rooted in a celebration for Crow life. 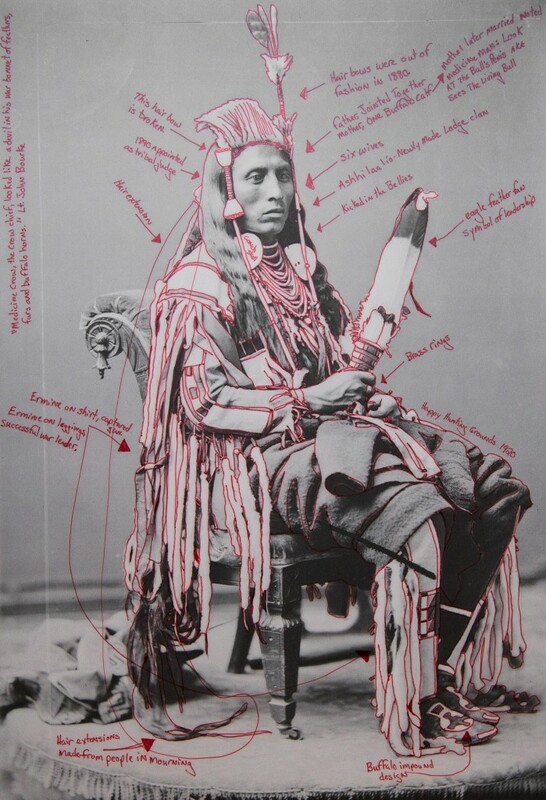 Red Star’s work responds, on her own terms, to these misrepresentations of Native Americans. I spoke with Wendy Red Star about representation, decolonization, and working in a genre that was used to define—and thus oppress—Native Americans for generations. Abaki Beck: I’m Blackfeet and when I think of my family, one of the first things I think of is humor and laughing. Always laughing at family events, even funerals. Humor, it seems, is certainly an aspect of your work, particularly in your series Crow Clowns and White Squaw. There’s a huge rift in how Indians are perceived by outsiders—particularly through noble, stoic images like those by Edward Curtis—and how we perceive ourselves. Can you talk about the role humor plays in your work? Wendy Red Star: I think what you said is similar to the experiences I‘ve had. I come from a humorous background, not just my Crow side, but my Irish side as well. I’ve always seen things through this ironic lens. I’m always laughing. In my own Crow community, we have a whole policing system that uses teasing. Any time a tribal member is getting egotistical, there is a cousin who will notice it, and their job in the community is to make fun of you and bring you down a couple notches. If you are sick, their purpose is to come and joke with you. So it’s very natural for me. Humor is healing to me. Like you mentioned with laughing at funerals, everybody is so sad at that moment, to have a little bit of laughter is healing. To have that element in my work is quite Native, or Crow, and I’m glad that it comes through. It’s universal. People can connect with the work that way. Then they can be open to talking about race. Beck: How do you think the photography of Edward Curtis and other historical images of Native Americans impact people today? Red Star: This country was founded on the eradication of Native people. We were also, paradoxically, used for tourism to promote the expansion of the West. Really what it all boils down to is humanity. I am always trying to show this in my work. We are human beings. For some reason, Native people are represented as eradicated, like in Edward Curtis’s The Vanishing Race (1904) project. It’s worked pretty well. I think people are surprised when they find a Native person because in the consciousness of America it’s like we don’t exist. We are these mythical creatures. The conqueror has set up an image of what Native people are. I always think of John Trudell and how he talks about the whole concept of The Indian as fiction, made up when the white people came. It’s true. We’ve lost our individuality as different nations. We were stereotyped into one thing. I’m currently doing a residency at the Denver Art Museum, but I am showing in the Native Galleries. I am happy that the Native Galleries exist and that the curators there see the need to have a contemporary Native voice there. But I’m not in the contemporary art gallery itself, which is where I want to be. Beck: There seems to be a dissonance between the arbitrariness of “Native Galleries” and the need, as you say, to recognize Native cultures and art in major institutions. How do you think Native work should be presented in museums? Red Star: It is important for curators of Native American art in museums to work directly with Native communities on how to represent the material culture in their collections. Museums like the Denver Art Museum, Minneapolis Institute of Art, and the Tacoma Art Museum, are working towards this initiative to highlight Native perspectives and shape the context of their collections. In terms of contemporary art curators and institutions, artists such as myself need to be included in the contemporary art dialogue, whether this is through exhibitions, public education, or conferences. Beck: Do you make your work to empower Native people and reclaim our narratives, or to educate non-Natives? Red Star: I really try to talk about Crow culture, because that’s what I know best. I do a lot of research-based work and I think that education is important and the Native perspective hasn’t been shared at all. It’s a fresh story and it’s not pigeonholed. A lot of people will say, “Well, that’s just Native history.” No, that’s everybody’s history who lives on this continent. It’s about decolonizing the way people are seeing things. Beck: Do you see your work as political? Red Star: As a brown person, as a brown artist, your work is political. Whether you like it or not. Even if you are doing abstract painting, as soon as someone finds out you’re brown they think, “This is about racism.” The first time I came across this was when I was in undergrad and I was erecting teepees around campus. I had discovered that Bozeman, Montana was Crow territory. I wanted everybody to know that this was Crow territory. I didn’t even think of it as political. I just thought, this is true. It wasn’t until years later that I realized they are saying it’s political because it’s against the colonial standard. I don’t aim to do political work, but it becomes political because it’s talking outside the colonial framework. Beck: Who are your influences in terms of finding a space for your own voice and representation in photography? Red Star: I look toward a wide range of artists and photographers for inspiration and influence. For aesthetics I enjoy the work of Erik Kessels, Rashid Rana, Joachim Schmid, and Matt Lipps. Regarding representation and politics, I engage with the works of Shirin Neshat, Carrie Mae Weems, and Catherine Opie. Beck: Have you observed changes in how Native Americans are represented in mainstream culture since you began working as a photographer? Red Star: Right now there are a handful of us Native artists who are starting to be included in the mainstream, which is exciting. We are starting to be included in exhibitions that are not all Native artists and not Native-themed. But we still have a long way to go. My career has been mostly museum-based, but what’s interesting is that I’m usually showing in the Native galleries with the Native curators. It’s great to be in the museum, but I am slowly starting to see my work included with other non-Native identity-based artists. But no matter how much I’d like to be shown in the contemporary section of the museum, often the most exciting stuff for me is on the Native floor. I don’t know how long it’s going to take, how many cycles, before Native artists show in major exhibitions. When will the Native artists have their chance? Beck: The recent events at Standing Rock have garnered national attention to Native American issues in a way that no movement has in years. What do you think is the role of Native photographers and artists in shaping this movement going forward? Red Star: I believe the role of Native photographers and artists in shaping this movement forward is to continue to draw attention and awareness. Social media is an excellent platform to expose the injustices that have plagued Native America. These platforms allow the Native voice to be heard on a grand scale. I find this to be very exciting as both a Native person and an artist. Abaki Beck, enrolled in the Blackfeet Tribe of Montana, is a writer, researcher, and activist based in Chicago.